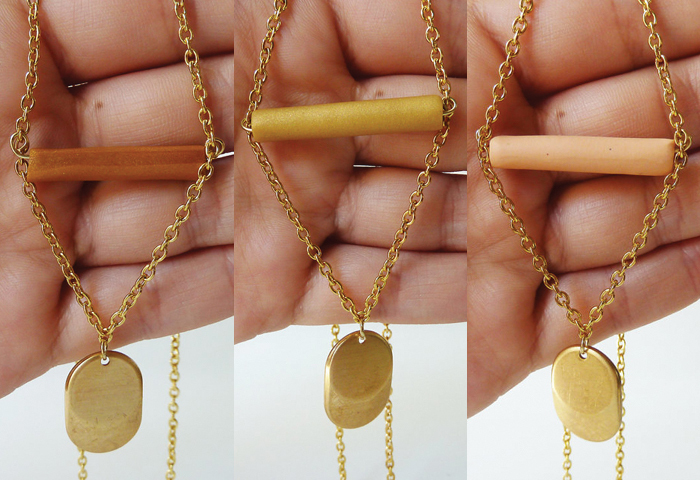 I just realized I never blogged about these necklaces I made after finding some brass charms, they look like 3D circles to me. I like working in these smaller, limited edition batches because it forces me to come up with something new often. I only have 4 of these left but I might keep one for myself. They're slightly longer than most of my necklaces, so I like how they look layered. I started making longer, round beads too while trying to find gold spacers with no success. This alternative is much better anyways, it still incorporates that one-of-a-kind handmade quality but with a simpler shape. These might be one of my favorite necklaces yet. I hope you like them as well! On another note, I sold my camera last week and have been waiting patiently for the new one to show, Monday. I'm upgrading which I'm excited & nervous about. I have a lot to learn so I'm afraid there's going to be a lot of trial and error. I'll need you to be patient with me while I try it out, hopefully I'll only get better with practice though, that's what I'm hoping for at least. They are lovely! Nice work. Can't wait to see how your photos turn out with your new camera!